Simple crayons can make beautiful art – and not just by drawing with them! Line up some wax crayons, rainbow-style, blast them with a hairdryer and they'll melt into a colourful artwork that you can hang on the wall. 1. Pick out the colors you want to use and line them up across the top of the canvas. 2. A rainbow colour pattern is made here. Of course you can try this with different color patterns instead of a rainbow. 3. 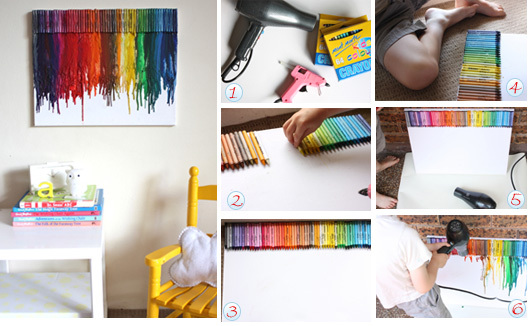 Using a glue gun, squeeze a line of glue across the crayons. 4. Quickly place the crayons on the canvas in a line, as shown below, with tips facing down. 5. Line the floor with a piece of newspaper, place the canvas against a wall, and get your blow dryin’ on. 6. You can start out on high and warm settings and alternate with low at certain points. You may have to experiment a little to see how your hair dryer works with melting the wax. It sometimes splatters a little, so be sure to cover the floor and surrounding wall with newspaper, and turn to a lower setting if needed. Once the wax starts melting, move the dryer around as needed to prevent splattering and so the wax drips straight down. Voila! Now you have a fun piece of art to hang on your wall.